This is one of several waterfalls that are in the gardens at the Veterans Centre at the Sunnybrook Health Sciences Centre. It is always a treat when the first waterlily flowers come out as they have in the last week. The birds in the area love having a bath on the rocks above the falls but I couldn't catch any this time. Ahhh. And a fine Japanese maple for the tree lovers. Hello, pretty waterfall and a peaceful spot. Happy Sunday, enjoy your day and new week! Thank I needed that, Pat! Looks like a nice place for a nap. I LOVE water lilies and we rarely see any in Arizona. I happen to be in California right now so I'm sure I'll get to see a few over here. It looks neat. Good place for the birds to cool off or get a drink. A nice cool place for the birds to stop by. But you sure caught a beautiful day at a very cool place! 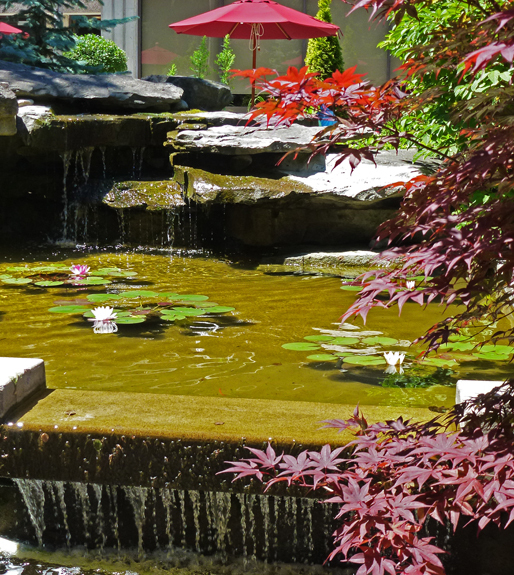 Water features are inviting for people and animals alike. Water lilies and running water like a waterfall are really appealing. What a lovely image, Pat !